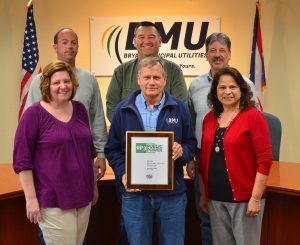 Shown front left to right with the award are Jackie P, Matt K., Sylvia R., (Back) Adam B., Al S., Jim C.
Bryan Municipal Utilities (BMU) has earned Reliable Public Power Provider (RP3) designation from the American Public Power Association (APPA) in recognition of the municipal utility providing reliable and safe electric service to local residents, businesses, industries and institutions. APPA recognized RP3 recipients on April 1 during the Association’s annual Engineering & Operations Technical Conference in Colorado Springs, Colorado. APPA is the national trade association of not-for-profit, community-owned utilities that power 2,000 towns and cities across the country. RP3 designation, which is valid for three years, recognizes public power utilities that demonstrate proficiency in four key disciplines: reliability, safety, workforce development and system improvement. Criteria include sound business practices and a utility-wide commitment to safe and reliable delivery of electricity. BMU joins more than 270 public power utilities nationwide that have achieved RP3 designation. BMU first received Gold Level RP3 designation in 2006. This year, for the first time, BMU achieved Diamond Level status—APPA’s highest RP3 designation level.